Start Empathy, an initiative of Ashoka, is a community of individuals and institutions dedicated to building a future in which every child masters empathy. 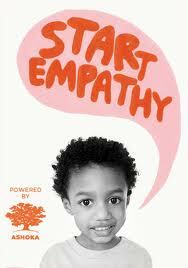 Start Empathy is working to unleash demand for empathy as a core 21st century skill – collaborating with social entrepreneurs, educators, parents, and key players in the media, business, and academic sectors to make empathy as essential as reading and math in early education. Success will take all of us, and will require rethinking how we parent, educate, and raise our children in a world that is changing faster than ever before.